Snoop Dogg, dean of American raps, is back in the headlines thanks to his culinary skills. The rapper and devoted BFF of Martha Stewart stormed the pop culture scene and never looked back after the 1993 release of "Gin and Juice," a song about Snoop's affinity for weed and other cool things. 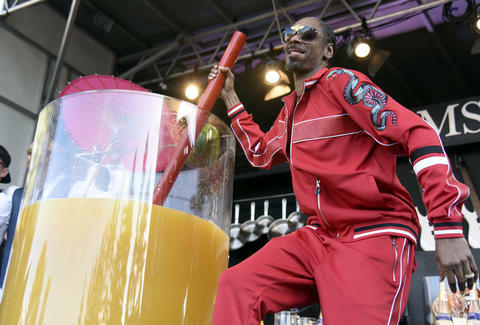 Flash forward 25 years and Snoop is still a staunch proponent of all things gin and juice, only bigger. At the BottleRock Napa Valley festival in northern California last weekend, the 46-year-old mixed the largest cocktail in recorded history, concocting a gin and juice from 180 bottles of Hendricks gin that stood 5 feet tall and 3 feet wide. The rapper had help from his West Coast comrade Warren G (R.I.P. Nate Dogg) and Top Chef winner Michael Voltaggio to make the cocktail. "largest paradise cocktail," perhaps because it was prepared with a cocktail umbrella.